With warm dappled light streaming in from the high glass ceiling, and a peaceful green framework surrounding the spacious seating, Burnt Orange is a like a little garden oasis amongst the fashion giants of Country Road, Camilla, and Cue. Situated on Level 1 of Chatswood Chase Shopping Centre in Sydney's north, I'm here with a couple of friends to sample their High Tea. We're warmly greeted by James, the manager, and shown to a comfortable corner table. "We've been in Mosman for seven years, and here in Chatswood for two. We wanted to keep a similar relaxed vibe as our Mosman flagship store", says James. "Of course we don't have the harbour views; here we wanted it to be more casual and affordable, to make it a happy family outing, and of course we can provide High Tea any time of the day", says James. Once seated, we choose our preferred teas - a full-bodied Russian Caravan and robust English Breakfast - and it's promptly delivered in individual pistachio-green bone china teapots. I can't help but take a peak inside and am instantly impressed to see fresh tea-leaves in the little wire cage, instead of sub-standard teabags. For someone who likes a decent cup of tea, I'm also impressed by the size and shape of these ones, rather than small white coffee cups which some establishments offer. With just minutes to savour our first refreshing cup, our High Tea Tower arrives, offering three levels of treats. We begin with the bottom level - a choice of mixed berry or plain scone with a side of crème Chantilly and home-made berry jam. We each taste small samples, as the richly textured scones are very generously proportioned and we've only just begun. The crème Chantilly is exquisitely creamy, a lovely juxtaposition to the sweetness of the jam and warming cinnamon flavour of the berry scone. As we move onto the finger sandwiches on the middle tier, I glance around and notice how the tables have filled, with several other groups also opting for the High Tea tower. James checks in to enquire if there is anything further we need, and promptly refreshes our teas. I sample the pastrami and seeded mustard sandwich first, and follow with the smoked salmon and dill-mayonnaise finger. The freshness of the dill and salmon is wonderfully settling on the palette after the zinginess of the mustard, and the accompanying sampler of cherry tomato-avocado and fetta san-choy bau with a garnish of radish and dill is the perfect accompaniment to the richness of the salmon. The 'crown' of the top tier is a medley of chocolate brownie, almond-and-lemon friand, and a delicate chocolate-and-fresh blueberry tartlet, garnished with slithers of fresh mango and strawberry. My first choice of friand is instantly my favourite of the day; a wonderful combination of very moist lemony tang and a smooth fine texture, perfectly accompanied by a smattering of crunchy almond slithers. The chocolate brownie is a melt-in-mouth rich molten chocolate inner, with a delicate crispness to the top layer, and decorated with chopped walnuts and warmed raisins. The mixture of textures and warm flavours is something I will remember and perhaps try at home. We rest a while, savouring the last moments of the brownie, have our teas refreshed again, all the while eyeing off the final perfection of the mini chocolate tartlet. Like a piece of art, plump blueberries sit atop a smooth chocolate base, with a dollop of fresh cream and strawberry slices for decoration. Decorum insisted I didn't just plop the entire piece in my mouth, afterall, sharing this delightful afternoon with a couple of girlfriends included sharing the divine tart as a finale. We settled back with the last of our hot and refreshing teas, completely satiated. The staff have been friendly and attentive with their service and the High Tea was just the right blend of savoury and sweet choices, without being over the top, portion or price-wise. It's also a great way of sharing a meal with friends, like a degustation dinner where one gets to sample a variety of dishes, rather than just one meal. 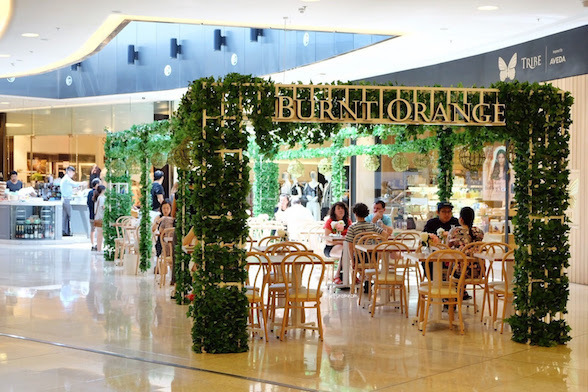 I'm not a fan of food courts, and Burnt Orange have lifted the bar of standard-fare shopping centre cafes. The indoor-garden vibe they've created on the quieter side of Chatswood Chase is a big plus, and the High Tea option is a lovely luncheon alternative. Observing the range of lunches being delivered to surrounding tables also makes me want to revisit and try their other meal options. 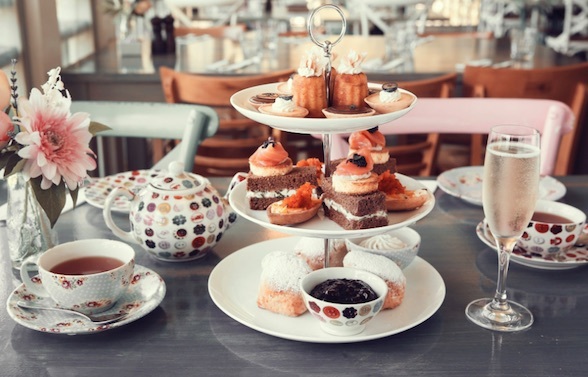 High Tea, including tea and coffee is $35 p.p. or add a glass of Veuve Tailhan sparkling wine to your afternoon tea @ $45 p.p. haven't been to the chase in awhile. mouth watering in every way. I have noticed a lot of these in some of the Westfield shopping centres nowadays..